A 501(c)(3) not-for-profit charitable organization. Chartered in 1989 with 14 founding members, the Seattle Chapter of Les Dames d’Escoffier, International currently comprises 79 members. Les Dames d’Escoffier, Seattle Chapter is an invitational organization of women leaders in food, beverage, and hospitality whose mission is education, advocacy, and philanthropy. Les Dames, Seattle focuses on raising funds for scholarships for women in the culinary, beverage, and hospitality industries. We also support community-outreach programs and sustainable-agriculture projects. All our efforts are based in Washington State. 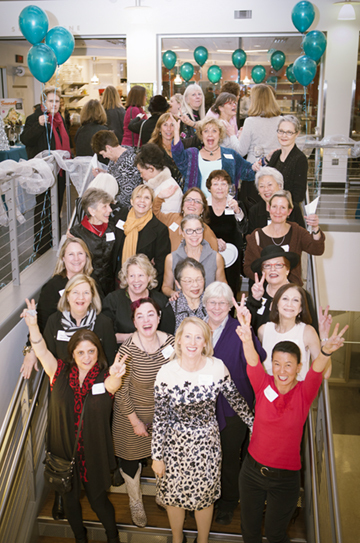 Every other year, Les Dames, Seattle undertakes a major fundraising auction, with a smaller fundraising event in alternating years. The group’s existing endowments are open funds, and donations are always welcome. We’ve awarded individual scholarships to over fifty-five deserving women and established scholarship endowments at 6 of the state's finest schools. For more information on our scholarships see details here. We have also gifted $50,000 to Seattle Central College’s Plant Science Lab and Greenhouse, a state-of-the-art classroom garden in which students learn garden-to-table practices. In 2010, the Seattle Chapter began offering Green Tables Grants to qualified 501(c)(3) organizations in Washington State. The grants support teaching and training students and personnel in areas such as seasonal healthy cooking, innovative solutions to providing healthy meals, and garden-to-table concepts. A total of $84,000 in grants have been awarded since 2010. To date, we have disbursed more than $700,000 through our scholarship programs and projects.